Expanding their line of cases for the iPhone 5, which is quite extensive right now to say the least, Spigen is now offering owners something similar to the flip covers that have been featured with Sammy’s line of smartphones of late. With the Spigen iPhone 5 Ultra Flip Case, you get that professional look to make you seem all business savvy from afar. So what’s to like about this one? 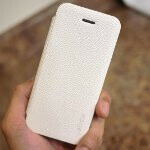 For starters, the case employs a two-tone diagonal stripe pattern that has a plasticy feel and a clean finish. It’s not bulky at all, thankfully enough, but it would’ve been nice to have some kind of magnetic connection or a latch to secure the front cover when it’s close. Instead, it simply dangles if you don’t clasp the handset with your own hands. Regardless of that, we appreciate that there’s a slit in the front cover so there’s no interfering with phone calls. On top of that, the inner portion of the front cover is lined with soft micro fiber chamude so that it protects (and cleans) the display. Interestingly enough, there’s a slit also running down the inner cover as well, which seems as though it can accommodate a card of some kind – whether it’s a credit card or ID. Naturally, not everyone is going to want a flip cover with their iPhone 5, but if you do, the Spigen Ultra Flip Case for the iPhone 5 is something to think about – though, its $37.99 price might be steep for some people. Spigen made the case, not Apple. Flips on the wrong side and covers the buttons, so you have to open it just to change volume or slide DND switch. One picture (5) looks like the case doesn't snap on well too. Thanks for that I didn't think about the volume buttons! That is no good.